Percents can be used in many types of problems and situations. Sales tax, which is the tax on the sale of an item or service, is a percent of the purchase price that is collected by the seller. Marcus buys a varsity jacket from a clothing store in Anaheim. The price of the jacket is $80 and the sales tax is 8%. What is the total cost of the jacket ? Use a bar model to find the amount of the tax. Draw a bar for the price of the jacket, $80. Divide it into 10 equal parts. Each part represents 10% of $80, or $8. 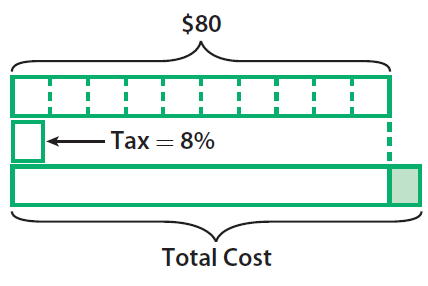 Then draw a bar that shows the sales tax: 8% of $80. Because 8% is 4/5 of 10%, the tax is 5/4 of one part of the whole bar. Each part of the whole bar is $8. So, the sales tax is 5/4 of $8. The sales tax is $6.40. To find the total cost of the jacket, add the price of the jacket and the sales tax. When we deposit money in a savings account, our money usually earns interest. When we borrow money, we must pay back the original amount of the loan plus interest. . Simple interest is a fixed percent of the principal. The principal is the original amount of money deposited or borrowed. total amount in the account after 2 years ? Find the amount of interest earned in one year. Then calculate the amount of interest for 2 years. Add the interest for 2 years to the initial deposit to find the total amount in his account after 2 years. Hence. the total amount in the account after 2 years is $212. After having gone through the stuff given above, we hope that the students would have understood "Applications of percent".